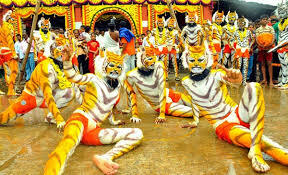 Many of you wouldn’t have even heard about something called as “Tiger Dance” which is celebrated dance art form which still exists in the Malnad region of Karnataka. This is an original dance formats that originated and evolved in the Malnad and Coastal regions of Karnataka and later spread to all other regions. The dance art format was among one of the favorites of kings and governors who ruled these regions in the past. This dance form involves artists to dress themselves as real tigers with a masks and the skin painted with strokes of tiger looking exactly like a tiger out of the cage. The painstaking costumes for these dancers are done by expert artists. 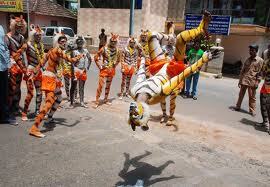 It’s literally painting done on the bodies of these tiger dancers. The night before the start of their dancing journey begins with extensive hours spent on intricate painting on the skin of the dancers including the face. The dance is popular during the Deepavali or Diwali festival and Dussera season. 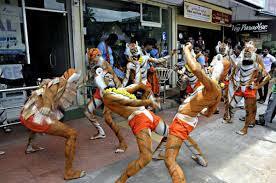 These dancers in batches visit every shop in the town and even houses located in nearby villages. It will be a feast for the eye to watch the acrobatic dance skills of the well trained dancers. The dance moves are matched to the drum beats and few of the dancers do extreme gymnastic stunts during their performance. They keep their momentum and stamina by biting and inhaling the lemon because, the costume on dancers sometimes would be burning their skin during a hot summer day. You must travel to these places to witness the authenticity of this dance format. We have travel experts who can intimate during these seasons and hook you up an accommodation so that you enjoy the most of it watching it live or even dance with them for the tune. If you are looking to contact these dancers to have a performance at your events or for a cultural function you can reach them by writing an email to us.